If there is anything certain about college football, it’s that there are no guarantees. Just one week ago, Miami quarterback N’Kosi Perry had thrown four touchdowns to lead the Hurricanes from 20 points down to defeat rival Florida State, seemingly securing his starting spot over former lead man Malik Rosier – at least for a few games. 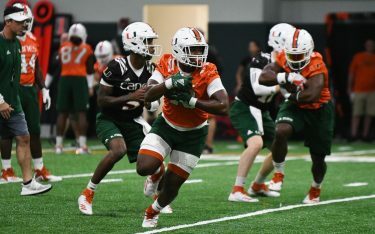 But by the 11:16 mark in the second quarter Saturday night against Virginia, Perry – who started the game but struggled – was sitting on the bench watching Rosier check into the game to lead the offense. Neither quarterback was effective, and the No. 16-ranked Hurricanes never led in a demoralizing 16-13 loss to unranked Virginia, almost certainly ending UM’s College Football Playoff chances. It’s apparent that Miami head coach Mark Richt was trying to preach this message to his quarterbacks: Nothing is given, and everything is earned. But the point Richt was trying to prove went in vain as Perry completed just three of his six pass attempts for 20 yards and two interceptions, while Rosier went 12-of-23 passing for 170 yards, with one rushing touchdown and one interception. Perry never re-entered the contest after getting pulled. Rosier pulled the deficit within three after an 11-yard touchdown run late in the fourth quarter, but it was followed by a poor special teams play on the ensuing possession where Virginia would run out the clock. UM (5-2, 2-1 ACC) totaled 339 yards of total offense, but a good amount of the yardage came with the Cavaliers (4-2, 2-1 ACC) clearly baiting the Hurricanes to waste clock. The Canes’ defense did their part, recording nine tackles for loss, four sacks and forcing three turnovers. But the offense couldn’t get any rhythm all night long. It was a sloppy performance by both teams, but Virginia capitalized on three Miami turnovers to score its only touchdown of the night, on a 7-yard scamper by running back Jordan Ellis. Only time will tell who will be the starter for Miami following its bye week. 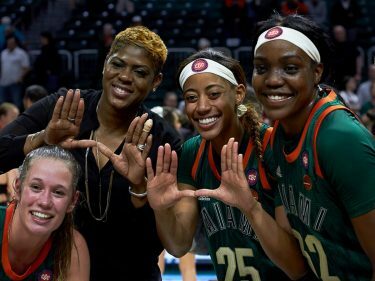 After the break, the Hurricanes will play at Boston College at 7 p.m. Oct. 26.